Fast forward 2 years later, quinoa seems to be the new health buzz word in North America. Everywhere I go, it is on restaurants’ menus and in grocery stores. It is even included in all the health books and magazines I’m hungrily reading to learn more about healthy food and diet. To sum it up: Quinoa is a seed (many people assume it is a grain, but it isn’t!!) that comes in white, red or black. It is a superfood because it is a good source of protein, fibre, complex carbohydrates, calcium, phosphorous, iron and vitamins B and E. It is also gluten-free! Therefore, it is perfect for vegetarians, vegans and people with gluten sensitivity or celiacs. As I’m now gluten-free and also trying to cut down on my meat consumption, quinoa is another great alternative I can turn to for protein, and substitute for rice or pasta. I am by no means an expert in cooking quinoa, and have been reading books and websites to learn how to cook it well, and getting some more recipe ideas. Anyways, I got really excited when I was chatting with my vegetarian friend Mythili and she mentioned she eats quinoa for breakfast! I thought what a wonderful way to start off the day with energy and happiness!! -Turmeric- has health and beauty properties, mostly anti-inflammatory effects and helps increase blood circulation thus contributing to healthier and radiant looking skin! –Milk- you can replace the unsweetened almond milk with any other type of non-dairy milk you like! For example, Mythili used rice milk for this recipe. -Fruit toppings- you can put any fruits you like on top! Mythili put blueberries in hers. Mix the quinoa, almond milk, water and ground turmeric into a pan at medium heat. Mix contents once in a while. Add sliced banana into the pan. When the quinoa is cooked, take the pan off the stove. Plate the food and add a handful of strawberries. 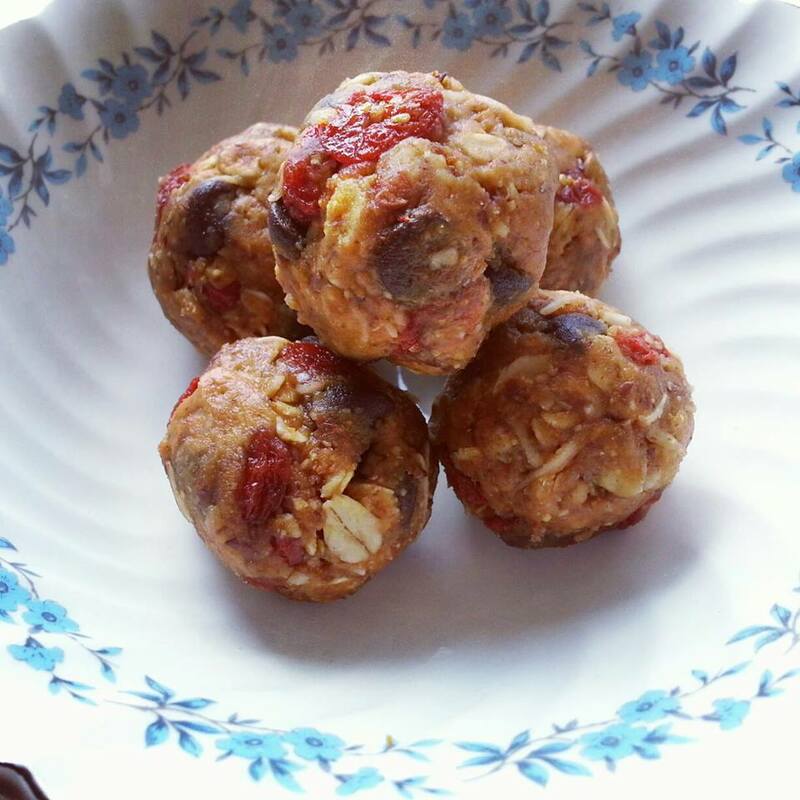 Suddenly I’m thinking about those very yummy sugary peanut butter balls I used to make with my cousins when we were younger, and since I had time on my hands this week, I decided to try it with a healthy twist. Here’s the easy no-bake recipe, that you can make in about 10 minutes. –Flaxseeds- They are high in omega-3 essential fatty acids (good fats), lignans and fibre. In fact, they have among the highest level of fibre in any food. They help stabilize blood sugar, promoting cleansing. Also, including them into your diet will help in having radiant and youthful skin. However, pregnant women and breastfeeding mothers should avoid consuming them. –Goji Berries- They are high in fibre, Vitamins A and C, and has 15 times the amount of iron in spinach. They apparently have the highest concentration of protein than any other fruits. Also, they have anti-inflammatory, anti-bacterial and anti-fungal properties. They can help boost the immune system as well. However, they do not interact well with diabetes and blood pressure drugs. –Unsweetened Shredded Coconut- It is high in fibre and minerals, and has natural fruit sugar which can add natural sweetness to food. –Storage- Keep up to 3 days in airtight glass container in the fridge, and best consumed within 3 days. –Sweetness- You can control the degree of sweetness by reducing the amount of manuka honey and chocolate chips to your preference. Use a tablespoon to scoop out mixture and roll into small balls. Store in an air-tight container in the fridge for 1-3 hours, or you can eat immediately if you prefer them to be room temperature. 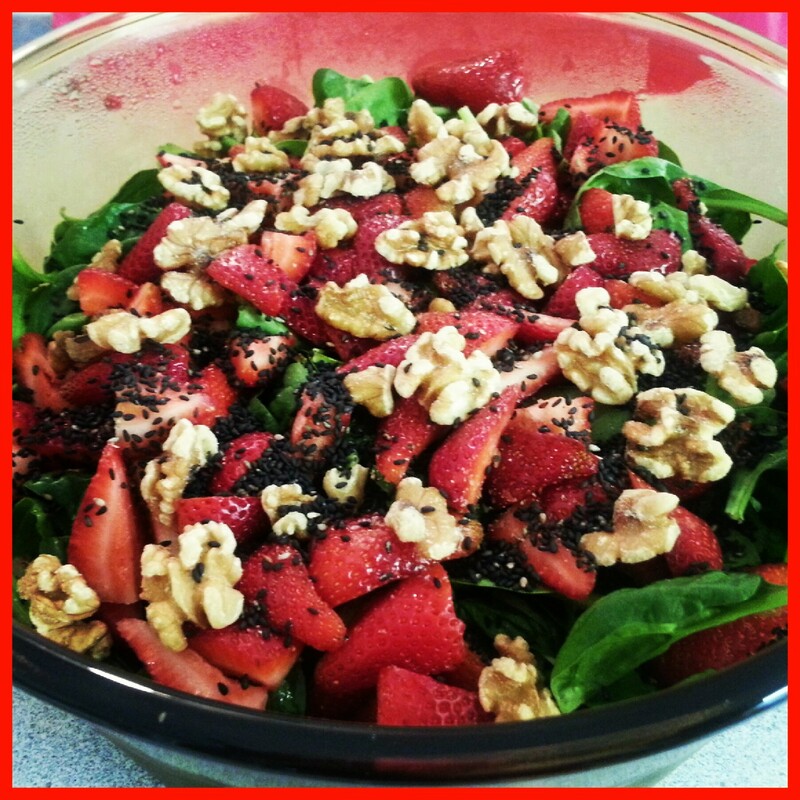 Simple and healthy ingredients: baby spinach, strawberries, walnuts, black sesame seeds and apple cider vinegar. Wash, drain and dry baby spinach and strawberries. Chop walnuts if you need to. Toss baby spinach, strawberries and walnuts in a salad bowl with the apple cider vinegar. Sprinkle black sesame seeds into the salad as garnish. Strawberries- One serving of strawberries provides 51.5 mg of Vitamin C, about half of our daily requirements. They are also good for our eyes and prevent wrinkles! Walnuts- They are high in protein, vitamin E (helps protect dry skin from environment), fibre, some B vitamins, magnesium, calcium and potassium. Also, they contain melatonin, a hormone that helps ensure good sleep (good sleep = radiant, supple skin) and increases antioxidant activity. Baby Spinach- It is low in calories and high in water content. According to the U.S. Department of Agriculture’s Pesticide Data Program, it is among the top 12 foods where pesticide residues are found, which is detrimental to our health. Therefore, it’s best to buy and eat only organically grown baby spinach! Apple Cider Vinegar (raw)- It helps promote the growth of probiotics (good bacteria in our intestines that aid in digestion) and helps balance the yeasts and bacteria in our bodies that feed off sugar. According to Kimberly Snyder, eating it may help alleviate sugar cravings. You have to buy a brand labelled “raw” and “unfiltered” to reap the many health benefits of it. Black Sesame Seeds-They benefit us in increased energy and longevity! In my search to find satisfying and healthy gluten-free breakfast, I came upon Kimberly Snyder’s book The Beauty Detox Solution- Eat Your Way to Radiant Skin, Renewed Energy and the Body You’ve Always Wanted, and began reading it avidly. I got inspired by her “Glowing Green Smoothie” (see her blog for recipe: http://kimberlysnyder.net/blog/ggs/). She claims that drinking a green smoothie or drink daily is the most powerful way to increase our mineral and enzyme consumption, which are critical to our health and beauty. She says “green-based drinks are the real super foods- not exotic, expensive or hard-to-find fruits or plants from foreign countries.” (Chapter 4: Beauty Minerals and Enzymes) Furthermore, dark, leafy greens are packed with many nutrients that are good for our bodies, and they’re better than any other food groups. Basically, having vegetables, especially the greens (e.g. kale, spinach, celery etc.) and fruits will nourish us completely. According to Health Canada, we should have at least 7-8 servings (if you’re female, and for males: 8-10 servings) of both fruits and vegetables per day (http://www.hc-sc.gc.ca/fn-an/food-guide-aliment/choose-choix/fruit/need-besoin-eng.php), which translates roughly into 2-3 servings of fruits and 7-8 servings of vegetables (I confirmed this information with my naturopathic doctor). Therefore, having a nutritious and fiber filled green smoothie is such a great way to consume our vegetables and fruits early on in the day. As I’m going gluten-free, I decided to give the green smoothie a try. Although I am nowhere near in drinking one per day, I do drink it 2-3 times a week for my breakfast. Perhaps, in the summer, I will challenge myself to drink Kimberly Snyder’s “Glowing Green Smoothie” every single day and see if it is true about becoming even more energized, more beautiful with radiant skin and leaner. She claims these are all the positive health effects one will have in drinking it daily. Keep you all posted on this! 2. 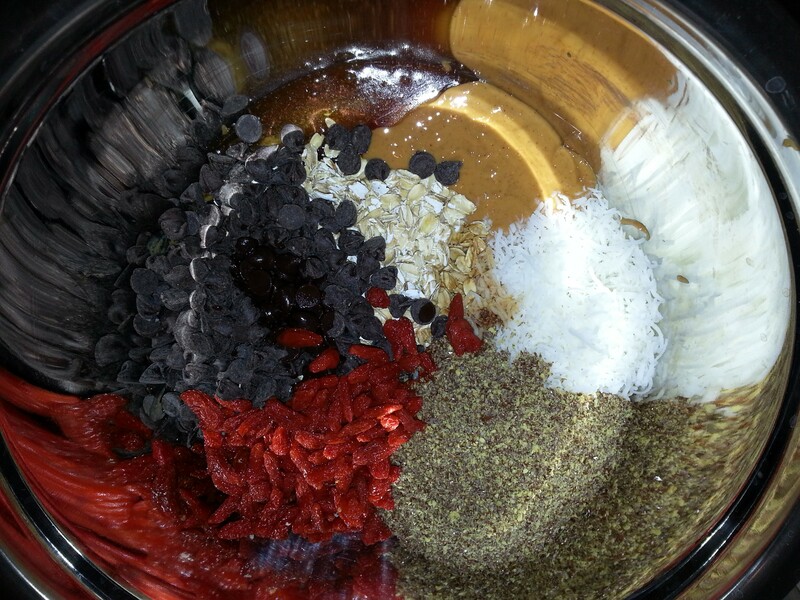 Sprinkle with cacao nibs and enjoy! 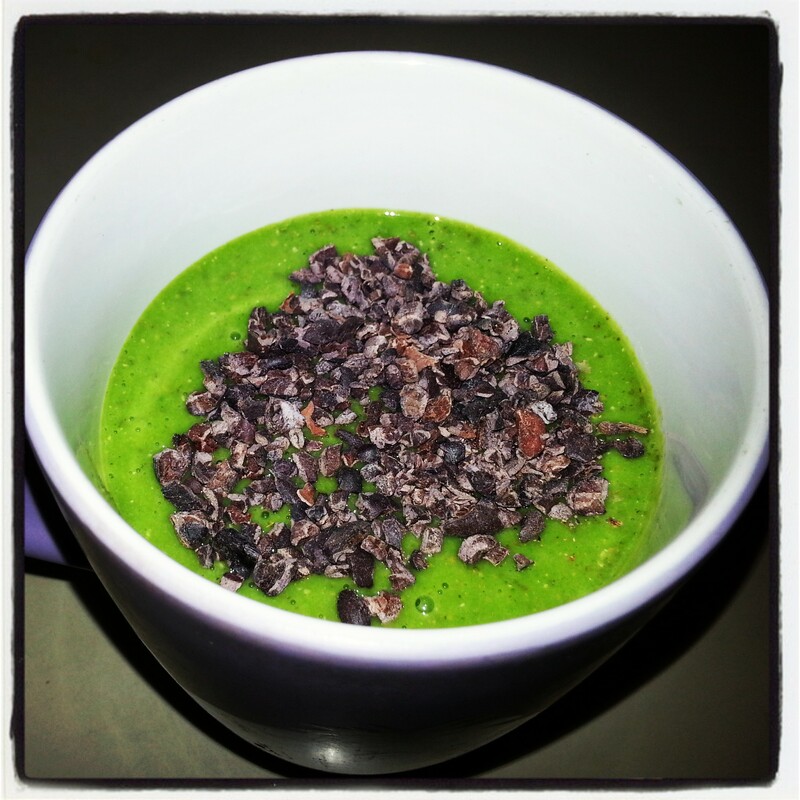 What ingredients do you put in your green smoothie? Up for a Sugar-free Cookie Challenge!! At the special request of my mother and grandmother, who are both diabetic, but still have a thing for cookies, I decided to rise to the challenge of baking some real “sugar-free” cookies for them. They gave me specific criteria of what they want in their sugar-free cookies. 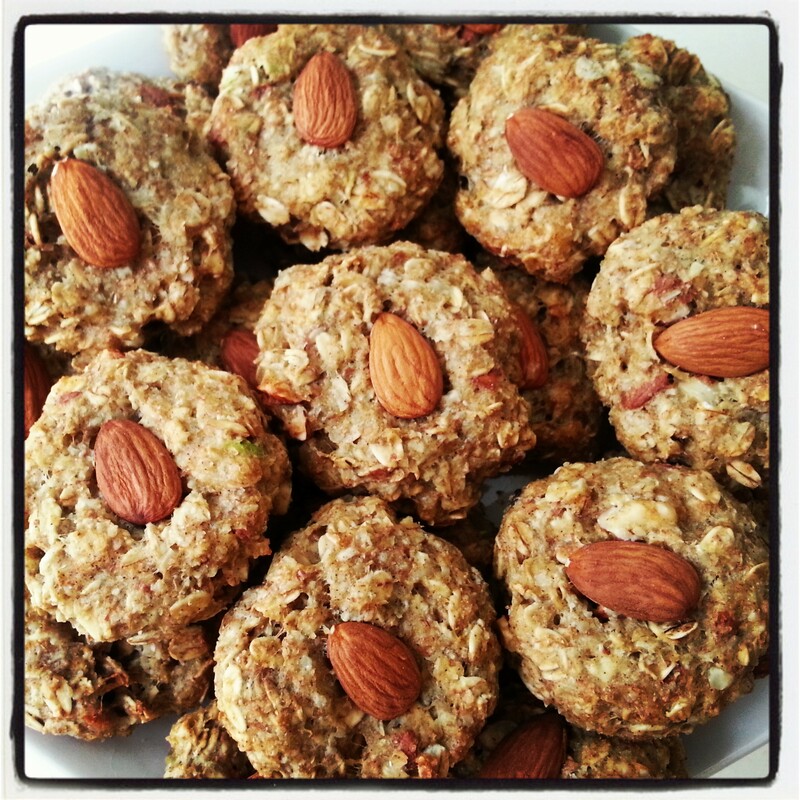 They wanted the cookies to be sugar-free, healthy (as in loaded with fiber, which they want to aid in digestion), and have almonds. Well, it was very fun to experiment in the kitchen and to come up with the perfect sugar-free almond cookie just for them! I would like to share the following recipe with you. These cookies are great for those who are diabetic or health conscious (especially those who do not prefer sweets or sugar too much). I have it on good authority that they are delicious when paired with a cup of steaming coffee or tea! My mother brought them to work, and her coworkers liked them so much that they asked me for the recipe. I hope you will enjoy making them as much as I did, and find joy in feeding them to the people you love! Special Notes: Avocado is used in replacement of butter. It’s a healthier option as it’s naturally creamy and rich already. Also, to give that extra almond flavour, almond meal/flour, unsweetened almond milk, and almond extract are used in addition to the chopped almonds. When the cookies are done, they should have a “cakey” or “biscuity” texture. 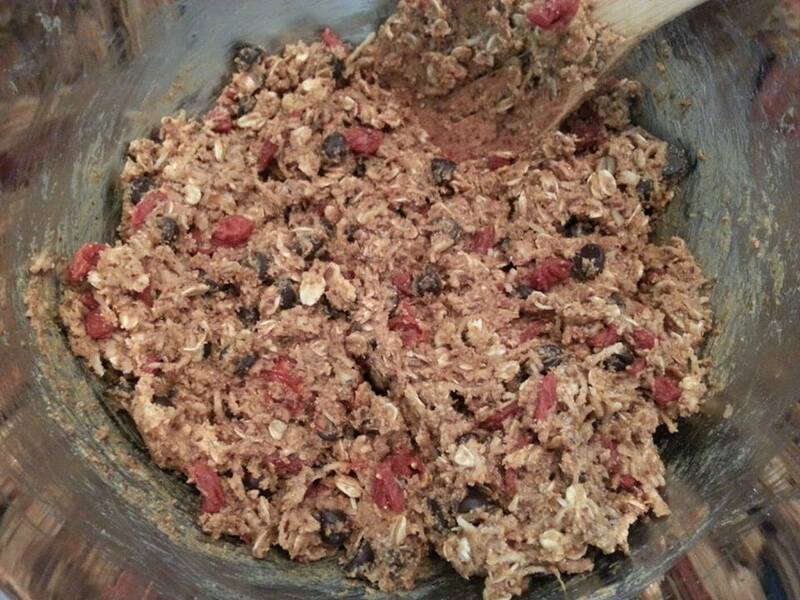 Mix oats, whole wheat pastry flour, almond meal/flour, cinnamon, and baking soda in a medium bowl. Mash the avocado or put it into a blender if you want it to be creamy. Blend avocado with almond milk, egg whites and almond extract in a large bowl with a wooden spoon. Finally, stir in the almonds. With damp hands, roll 1 tablespoon of the batter into a ball, place it on the baking sheet and flatten it to about 1 cm thick; don’t let the sides crack. Continue until batter is gone, spacing the flattened balls 2 inches apart. What do you think of these cookies? Would love to hear from you! A Simple & Satisfying Superfoods Salad! My Avocado, Blueberry and Kale Salad, minus the chia seeds and pumpkin seeds. In my haste to eat it, I forgot to add them for the photo! Lately, I’ve been absorbed in reading about the kinds of healthy food we should eat to maintain good health and nutrition. I learned about the “superfoods”. It is a term coined for food that have many health and healing benefits and nutrients for the body. I have been slowly adding some of them into my daily diet. Of course, there are so many of them, that one can get overwhelmed. Therefore, it’s one day at a time for me! Anyways, the other night I was flipping through my newly purchased book written by Kimberly Snyder called The Beauty Detox Foods: Discover the Top 50 Beauty Foods that Will Transform Your Body and Reveal a More Beautiful You, and was excited to try her Blueberry & Avocado Salad recipe, since I love both of these superfoods, and knew I had them in stock. Today seemed like the perfect day to try it out as I felt like having something light and refreshing for lunch. In my journey of healthy eating so far, I learned that making your own food is so much better because you control what goes into your mouth, and ultimately your body! Without further ado, please enjoy my version of the salad, inspired by Kimberly Snyder, using some other superfoods. I guarantee that you will find this salad simple to taste and make, but very satisfying! Wash, drain and dry blueberries and kale. 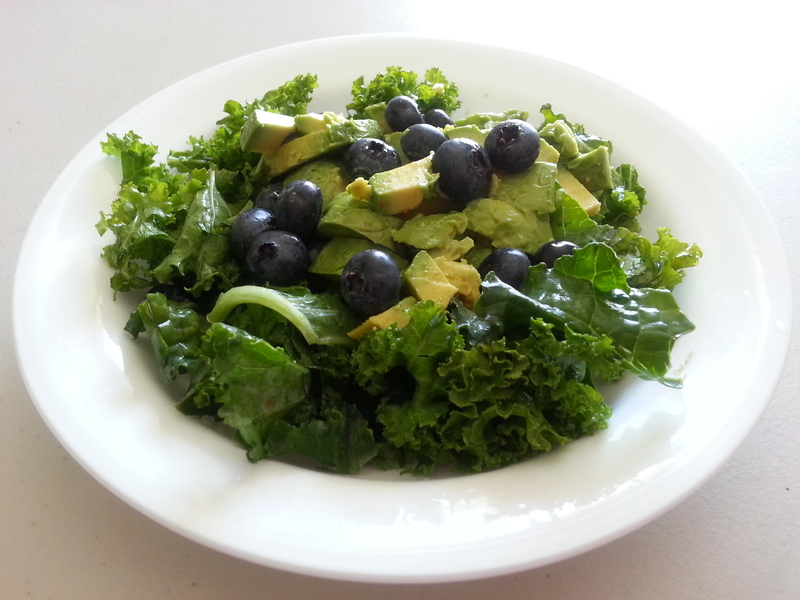 Toss kale and blueberries together in a salad bowl with freshly squeezed lemon juice from the wedge of lemon. Place chopped/sliced avocado on top of the salad, and if you prefer, you can also squeeze a little bit of lemon juice on them. If you have chia seeds and/or pumpkin seeds, sprinkle them into the salad as well. Avocado- It is filled with fiber and healthy fats, lowers cholesterol, and keeps skin smooth and youthful. It helps protect the body from heart disease, cancer, degenerative eye and brain diseases. Blueberries- They are high in water and fiber, which help to cut down sugar cravings. They make eyes (the antioxidant anthocyanin strengthens eyes and vision) and skin beautiful, plus promote brain function, lower stress level, and boost energy. They also help to prevent the body from diseases such as cancer, heart disease, stomach ulcers and high blood pressure. Chia Seeds- They are high in fiber, antioxidants, omega-3 fats, protein, calcium, potassium and iron. They are a good workout food, as they supply the body with strengthening and toning nutrients. They also help with digestion. The most amazing thing about this superfood is that they swell more than 5 times their weight in liquid so it means when you add 1-2 tablespoons of them to meals, you will feel fuller faster, and have a long burning source of energy. Kale- It is rich in iron, copper, minerals, vitamins A, C, E and K, magnesium, calcium, and omega-3 fats, and antioxidants. It is high in fiber so it helps to tone up the body, and make it strong and resilient. Also, it is an anti-cancer and anti-aging food! One cup of kale provides about 10% of the RDA of omega-3 fatty acids, which help fight against arthritis, asthma and autoimmune disorders. Other interesting facts about this superfood is that per calorie, it has more iron than beef, and more calcium than milk! No wonder it is called “the new beef” and “the queen of greens”!! Lemon- It is rich in vitamin C, balances our pH level, detoxifies the liver, helps to eliminate waste in our body and improves our digestion. Pumpkin Seeds- They are rich in zinc, magnesium, iron, calcium, phosphorous, manganese, copper, sulfur, vitamins A, B, C, E, K, fatty acids, and protein, and contribute to the growth of healthy and shiny hair. The high zinc content helps in avoiding acne and other skin imbalances. They help stabilize blood sugar which means weight loss. Like the lemon, they balance the body’s pH level. A great fact to know, if you’re looking into moving away from getting protein from meat, is that a 1/4 cup serving of pumpkin seeds provides approximately 16 percent of your daily value of protein. 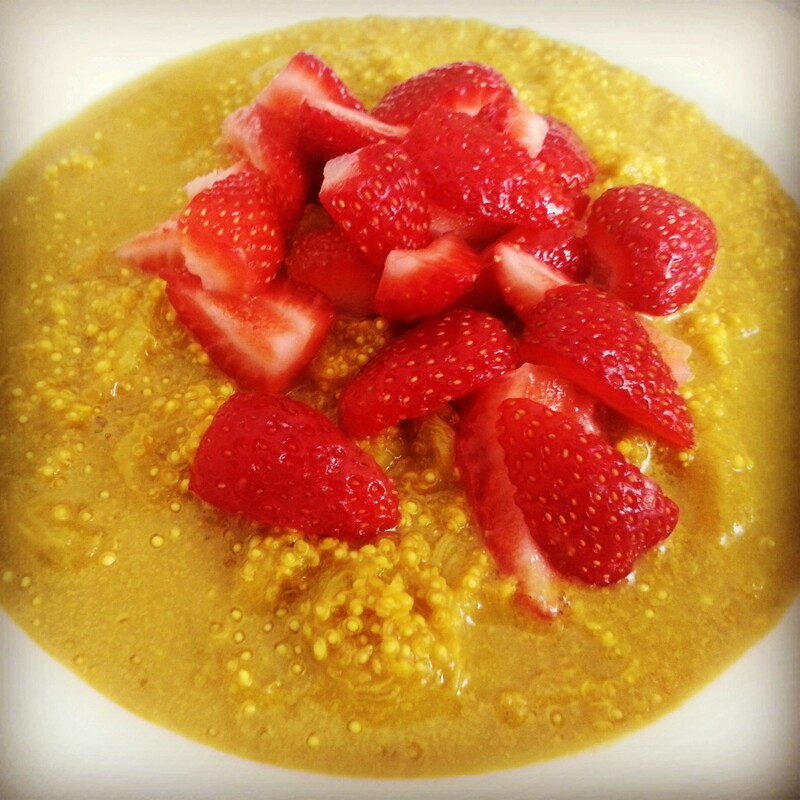 What are your favourite superfoods, and how do you eat them? I would love to hear how you add them into your diet, and learn some new recipes for my healthy eating lifestyle!